Almost anything you can imagine to trade is available in the commodity futures and financial futures markets—and through Rosenthal Collins Group. From corn and soybeans to gold, crude oil and currencies, you’ll trade in vibrant markets used to establish benchmark prices around the world. There’s something for stock and bond traders, too, with a multitude of stock index futures contracts on international stock markets as well as U.S. Treasuries. 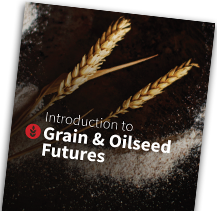 Our roots in the commodity futures brokerage business are in the grain futures markets—corn and wheat—which began trading in our hometown of Chicago in the mid-1800s. Soybean futures came on board in 1936, with soybean meal and soybean oil futures in the 1950s. Livestock futures joined them in the 1960s, to provide price discovery in both cattle and hog futures. The ultimate commodity is money, which is why currency futures attract such a global assortment of traders. The most popular futures contracts are paired with the U.S. dollar and include the Euro, British pound, Swiss franc and Japanese yen. Also, look at the U.S. Dollar Index futures contract for a take on the currency’s overall health. Trading power is powerful, and you have many choices in this global marketplace. Crude oil futures come in both WTI and Brent varieties. There are also the byproducts—heating oil and gasoline. Not to mention a growing alternative—natural gas. Certain food and fiber products comprise the “soft” commodities futures markets. These raw products—such as sugar, coffee, cocoa and cotton—are priced in the futures markets and find their way into your everyday life. Precious or industrial metals futures provide a unique look at the world’s economy. Gold shines most brightly among precious metals futures, which also include silver, platinum and palladium. On the industrial side, copper and aluminum futures contracts stand side-by-side with zinc, nickel and lead. One of the oldest financial futures contracts is the U.S. Treasury bond, which began trading in Chicago in 1977. On the shorter end of the yield curve, look at U.S. T-notes, Eurodollar and Euribor. Other countries offer contracts including the Euro-Bund, Japanese Government Bond (JGB) and Long Gilt. Rosenthal Collins Group principal Les Rosenthal was Chairman of the Chicago Board of Trade when stock index futures trading began in 1982. Today, to have a futures contract representing a country’s stock market is a badge of honor—one that China added with the fast-growing CSI 300 in late 2010. By 2012, it was the most-traded index in Asia outside of Japan. For the U.S. stock market, select from broad indexes including the Dow Jones Industrial Average® and S&P 500®, as well as those for mid-cap, small-cap and NASDAQ® stocks. Volatility traders flock to VIX futures.